Latifah Saafir, co-founder of the LA Modern Quilt Guild, has reinvented her blog. Her new home on the www is http://www.thequiltengineer.com/, and it’s looking awesome. I especially love her latest quilt. Tons of awesome new fabric on the way. I’m greedily eyeing the new LizzyHouse line, Castle Peeps. And not just for the awesome name! 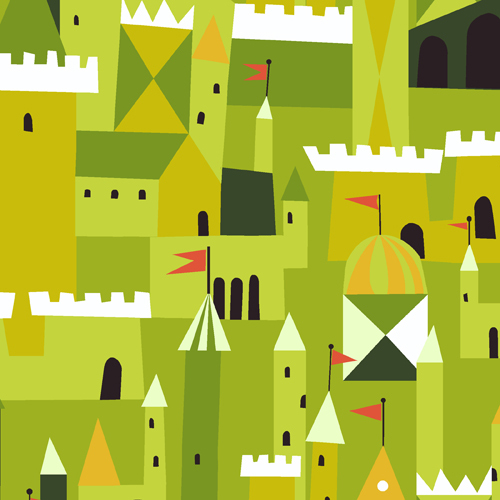 I especially love the castle-scape prints, although I truly love the whole line. It looks like Fabricworm will have it on sale any day now. And look at this Villagers Rejoice quilt! Super awesome. You can read all about it and download the pattern here. And of course, I’m counting down until Far Far Away II is released. Can’t wait! Oh Abi! Thanks so much all the love! :-) And thanks for the awesome comment on my site. To answer your question, yes it is built like a log cabin – adding a side at a time. Maybe I’ll have to do a little demo. So glad you like the site and the quilt! Yay! Smooches! Hi there…I’ve seen your camera straps and LOVE THEM! In particular the grey dot strap…and black/white polka dot strap (I’ve seen them on your blog here – I think you made them for a conference). Am I able to order one of these through you? I’ve had a look on your etsy site but couldn’t see either of the ones I liked listed…and wasn’t sure if the custom listing was for the patchwork straps. I have to say I’ve been looking for ages for a gorgeous camera strap…and had just about given up trying to find a fabric one. And I’ve seen lots! Everything was either too busy/yucky fabric…or the nylon part was ugly…or a horrible tag (yes I am that picky). Yours are simple…stylish…and so is your tag! Exactly what I’ve been searching for. Look forward to hearing from you and putting through an order for your divine camera straps! Skippy Jon is a favorite at school. There are several Skippy adventures now. You should also make sure you check out Pigeon books by Mo Willems. Thanks so much for your comment – both here, and on my Moxywares fan page on facebook. Sorry for the delayed response. I’m just putting the finishing touches on a grey dot strap and plan to get it in the shop by Friday. I don’t have any black/white dot straps made, but I have plenty of that fabric. I’ll make one and get it in the shop and if you’re interested, you can choose between the two.